Moscow is the capital of the Russian Federation, formally known as the Soviet Union. This is the first visit by the independent transport videos cameras to this part of the world to record the trolleybus and tram operations for you to enjoy. 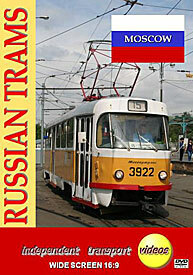 In this programme we concentrate on the trams in central Moscow and it’s suburbs. As you can imagine, Moscow is a vast sprawling city, most of the journeys by public transport are made on the city’s huge Metro system built after the Second World War by the Communist government. Buses, trams and trolleybuses play a smaller role in central Moscow, but are far more prevalent in the large amount of suburbs that surround the city. Our programme starts in central Moscow at Usyinsky Pr. where we see a familiar Tatra T3 tramcar built in the erstwhile Czechoslovakia, running with similar style Russian built cars. This location is as near to central Moscow and the Kremlin that the trams run, so to see more action we have to go out some of the many suburbs. Filming starts in Shchukinskaya where we are surrounded by Tatras, some in the ubiquitous Communist red and cream livery, and some in a yellow and white scheme. The female drivers loved being filmed, with smiles and kisses being blown at the cameraman! We then ride on Tatra 3402+3413 on route 30 to Voykovskaya for a busy late afternoon session at the tram terminus. Our cameras then take a ride on car 3012 on route 27 to Demitrovskaya. Other locations are at the main intersection of routes 23 & 27 and at the Mikhalkovo turning circle where we arrive on car 3354 on route 23. Other suburbs that feature on the programme are Kurskaya, Aviamotornata, Proletarskaya and Taganskaya Ulitsa, before returning to central Moscow for some more scenes at Usyinsky Pr. and Solyanka Ulitsa. There are more tram rides for you to savour as our cameras travel around this fascinating city. We finish the programme off with a montage of Metro trains running through the cathedral like stations on the vast Metro system. Enjoy the views and the rides! Our next DVD programme looks at the trams and trolleybuses of St. Petersburg.